Are you ready for winter weather? 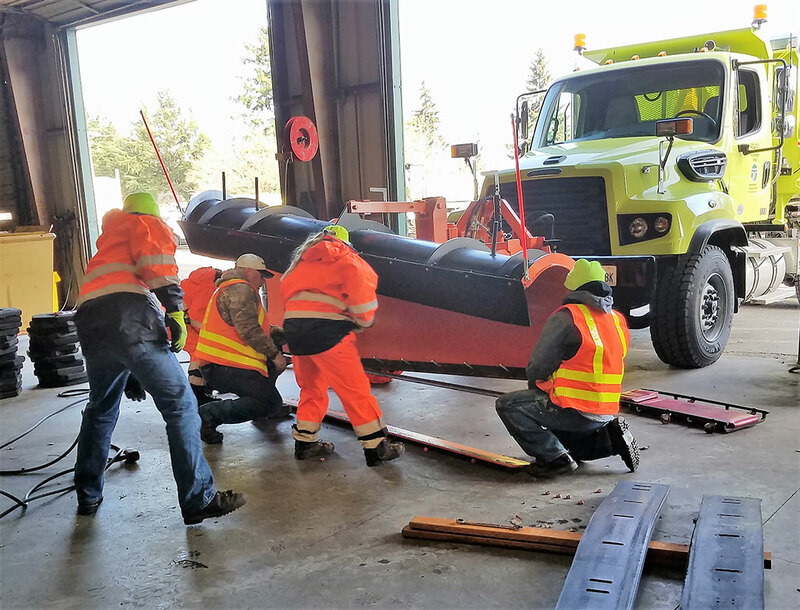 Our maintenance crews have been preparing for several months, long before the first snowflake hits the pavement, and are ready to go. We’ve readied our equipment, trained new members of our crews and filled our salt and deicer stockpiles. Our maintenance crews have been working for months to prepare for the winter. But responding to snow and ice situations on the highways is more than just being ready to roll. It's a balancing act between the forces of nature, available crews and keeping equipment running. While we work 24/7 during snow and ice events, we can’t be everywhere at once. Statewide we have approximately 500 plow and dump trucks. These trucks need to cover more than 20,000 lanes miles. To efficiently treat roadway surfaces during snow and ice events, our trucks travel about 25-35 miles per hour. Snowplows typically move 25-35 mph to safely remove snow off highways, like SR 504 in Toutle in this picture. 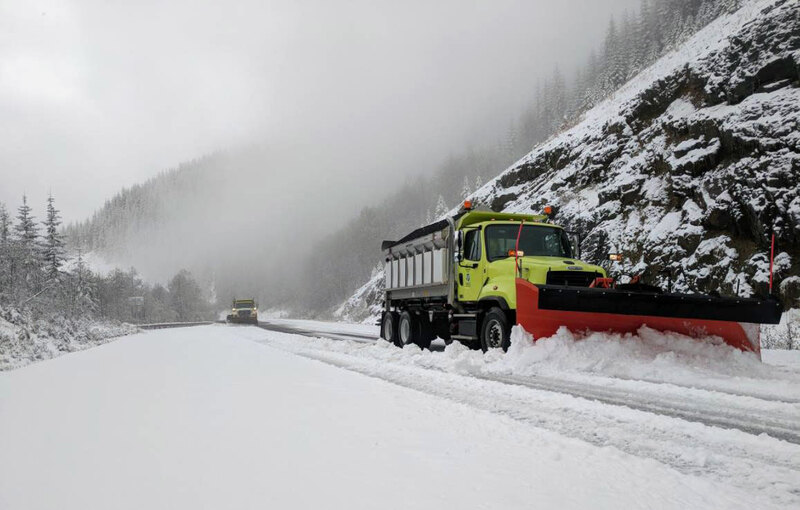 During many storms, snow continues to fall for hours and sometimes days, so a single pass with a plow isn’t enough to keep snow and ice from building up on the highway. We use advanced weather forecasting to predict where snow and ice will accumulate, and use the information to pre-treat high traffic corridors. The anti-icing chemicals we apply help prevent frost and ice from bonding to the pavement. Once snow has started falling and accumulating, we switch to a salt pre-wet with a corrosion-inhibited liquid deicer that helps snow and ice to melt, making it easier to remove with snowplows – but it takes time to work. For a closer look at the priority snow and ice routes near you, check out these maps. Our highest-priority routes as our primary focus is to keep interstate corridors open. Interstate 5 is the busiest roadway on the west coast and is vital for moving people and goods to support the economy. From the onset of an event, our goal is to keep at least a single lane open in each direction and work towards bare and wet pavement across all lanes. These are important intercity and local routes, which carry between 20,000 and 80,000 vehicles per day. These stretches of highway include many of the east/west routes like sections of US 2, US 12 and SR 14. These routes generally carry fewer than 20,000 vehicles a day. The priority levels of some of the green highways change, as the number of people using the highway and geography changes, like US 101 near Discovery Bay. Winter climates differ greatly on either side of the Cascades. You’ll likely notice more orange routes in Eastern Washington, like SR 21. That’s because snowfall and freezing temps often occur throughout the winter on the east side of the Cascades. Our priority is to keep traffic moving under normal expected winter conditions for the 5,000 to 10,000 vehicles that use these roadways daily. Less than 5,000 vehicles use these routes per day. Some of these roads, like the upper reaches of SR 504 on Mount St. Helens, are often closed during the winter months. We partner with agencies around the state to manage sections of highways which pass through many cities and counties. Winter weather response is our single most expensive maintenance activity, making up almost 20 percent of the entire maintenance budget. Our snow and ice plan is a holistic approach to shifting our limited resources to where the highest number of people and vehicles are located to keep traffic flowing. means clearing at least one lane like this in Vancouver. Removing snow and ice off state highways takes time and our resources are limited. 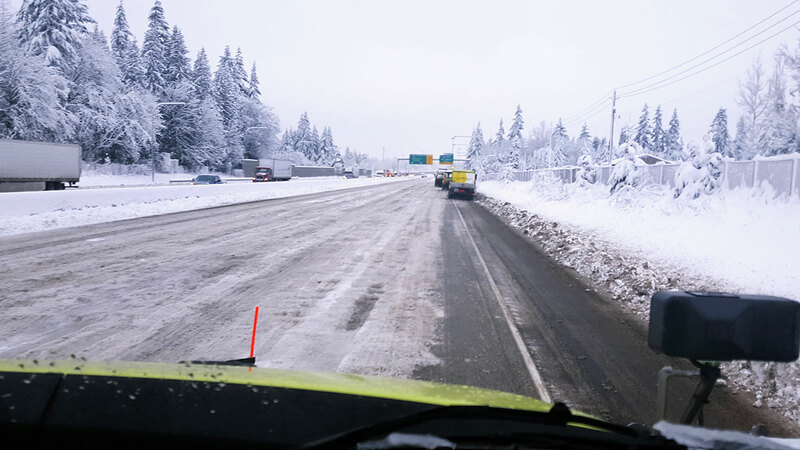 During periods of relentless snow and ice, we may not have enough crews or trucks to treat some of our lesser-traveled highways – even with crews working around the clock. Heavy traffic can delay snow and ice cleanup as plowing and deicing isn’t possible if vehicles are blocking the roadway. Knowing the plowing priorities along your route can help you plan your trips, including knowing to expect winter conditions on certain roads or possibly delaying travel during particularly heavy storms. Making the choice to travel during inclement weather is different for everyone. It only takes one crash or stalled vehicle to jam up the system for hours. Make the best decision for you, your family and all the other folks on the road by planning ahead. Plowing highways helps but drivers also need to be prepared to slow down and be cautious in snow and ice. Cities and counties throughout the state often post their priority routes on their web pages. Knowing which of the roads you travel get the highest level of service can help you develop a winter weather travel plan. While Thursday, Dec. 21, marks the official start to winter, we’ve already seen snow and freezing temperatures effect our highways, cropping up seemingly out of nowhere with little warning. We’ve got our plans in place to respond, and establishing your own plan now will help you know before you go when it snows.